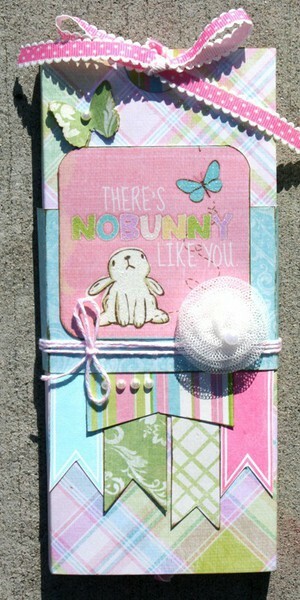 I made this cute Easter candy bar slider for my WRMK Guest Designer project. These are cute and easy. To make one, start with a piece of patterned paper that is 8” x 8¼” in size. (Use the thicker stuff that is almost cardstock but not quite as thick.) Along the 8¼” side, score at 3½”, 3-7/8”, 7-3/8”, 7¾”. Fold your score lines to make a sleeve shape for the candy bar. Apply adhesive to the last ½” strip to keep the sleeve closed. I use the red tacky adhesive tape, becasue it holds the best. Punch out a circle, cut it in half and adhere a half to both the front and back top of the sleeve. Punch a hole at the top edge on both the back aand front to feed the ribbon pull through. The ribdon goes inside with each "tail"coming from the inside out of the holes at the top. Push the candy bar down into the sleeve with the ribbon under it and finish it by tying a bow. As you pull the ribbon’s bow up now, the candy bar will slide out. Cut a coordinating wrap 8¼” x 2". Score it at the same points as the main sleeve. Crease your score lines, wrap it around the sleeve and adhere it. Now decorate and embellish any way you choose. This is super cute! Thanks for the directions! So cute! Fun and easy! This is so cute! Thanks for the tut! You make it look so easy!